We made the short (22 km) drive into Charters Towers with the intention of having a look around and continuing on. We found the town delightful - full of lovely, quite grand civic buildings. Modern conveniences like their Woolworths supermarket and Target store had been successfully integrated into the main street, the Target actually using an old department store building. Compared with Townsville where the downtown is dying because everyone has gone off to shop in the outlying ugly malls, Charters Towers is a model of how to do it right. and bougainvillea romping over the fences. 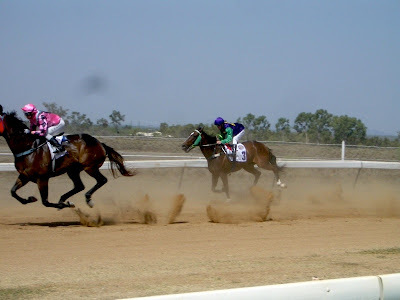 Our decision to stay for the night was clinched when we found that we had arrived on the day of their annual races, held in conjunction with the more famous Caulfield Cup in Melbourne. 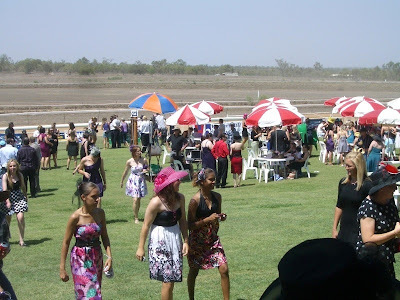 The locals had all dressed for the occasion, the men in moleskin pants, pressed cotton shirts and Akubra hats; the women in short skirts, high heels and fascinators. There was more satin than at a high society wedding. We were among the most shabby, of course, but I consoled myself with the thought that I was perhaps the only one with a Parisian outfit: I'd bought my shirt in Paris when we were there a year ago.